AU$485.00 Export; AU$534.00 inc. GST. NEW Model !! Supports PC and Mac OS 9 and OS X ! The USB Live! New Edition Video Capture Adapter is the ideal way to bring video and still images into your computer from various standard video sources, such as video cameras, camcorders, VCRs or TV tuners. Designed using own specialised chips makes this better than other similar products on the market. Advanced compression technology and software enable unparalleled throughput of up to 30 frames per second for CIF size color images (352 x 288). Our technology gives the user superior live video performance, while using minimal USB and CPU resources. USB Live! New Edition captures live video and fully complies with Video for Windows and YES, it also works with Apple MacIntosh computers ! This means that the video can be used with popular video and imaging capture applications for Microsoft Windows as well as Apple Mac. Such as video streaming, web page design, and video conferencing. Video clips and still images can be incorporated into your web pages or used with desktop presentations. You can also incorporate video clips or still images from family events or business meetings onto your web site. Stream your video to your employees or friends using various software packages. Video conference is possible using software such as Microsoft NetMeeting or CU-SeeMe for IBM and Apple MacIntosh. The USB Live! New Edition Video Capture Adapter gives you the ability to create video Email messages. Creative webmasters can incorporate video clips or still images onto web sites. Installation is a true plug and play experience. Install the included software drivers, snap USB Live! 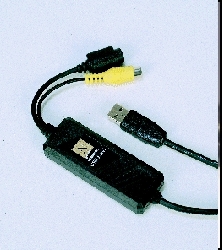 New Edition USB cable to your PC and attach your camera, camcorder or any other video source to the Composite Video RCA or S-Video input jacks. Now you are ready to begin capturing live video, creating amazing still images, or Video Conferencing. Full motion video - 30 fps at CIF resolution Video capture via USB. VGA (640X480) resolution still image capture. Works with PC and Apple Mac. Software controlled digital PAN and ZOOM. Compatible with TWAIN applications for still image capture. Powered by the USB port. Width: Any multiple of 16 within the limits listed below. Height: Any multiple of 12 within the limits listed below. Limits: Any resolution from 80x60 to 320x240. (Includes QCIF and CIF). High Resolution Still Image: 640x480 RGB 24 Bit. Video for Windows compatible capture driver. - USB Bandwith: Adjustable. 0.5 Mbps - 7.5 Bbps in 0.5 Mbps steps. - Operating Voltage: Powered by USB Port. 5V, 300mA maximum during operation. - Case Size: 21x80x27mm. Very small! - Environmental Operating Temperatire: 0-50 Degrees Celcius.